Blueberry biscuits are great for breakfast with your morning coffee. I can’t go long without a biscuit. I don’t care what kind of biscuit it is, I like it! These are wonderful and I think you will love them. Blueberry biscuits are perfect for brunch. You might also like our recipe for bacon cheddar scones. Blueberry biscuits are a perfect way to use up blueberries. Mix flour, baking powder and sugar together with a whisk. Cut in butter in pieces. Beat egg and milk together in a separate bowl. Add to dry ingredients and mix with a spoon. Fold in blueberries. Turn out onto a floured surface and pat to about 1/2 inch thick with your hands. Cut out with biscuit cutter. Place on a sprayed baking sheet with biscuits touching. Bake in preheated 425 degree oven for 15 to 20 minutes until biscuits are brown on top. This makes about 12 biscuits. We like these biscuits either with butter and honey or with a powdered sugar glaze. The glaze is posted below. In a bowl whisk together the milk and sugar until you get the consistency you want to drizzle over the biscuits. You will want to eat all of these delicious Blueberry Biscuits. The perfect start to any morning! Mix flour, baking powder and sugar together with a whisk. Cut in butter in pieces. Beat egg and milk together in a separate bowl. Cut out with biscuit cutter. Place on a sprayed baking sheet with biscuits touching. Bake in preheated 425 degree oven for 15 to 20 minutes until biscuits are brown on top. This makes about 12 biscuits. We like these biscuits either with butter and honey or with a powdered sugar glaze. Don’t forget to pin blueberry biscuits. © The Southern Lady Cooks photos and text – All rights reserved. No copying, posting on other sites, or other uses allowed without written permission of the copyright holder. Feel free to “share” with your friends by clicking on the Facebook, Pinterest or Twitter buttons at the bottom of each post. You can print by clicking on the green printer icon below. Be sure to look on the right hand side of any page on this website and put in your email address to sign up for our free newsletter. Your email address with not be shared with anyone and you will receive new recipes, tips, printables, articles and much more right to your inbox. Join 20,000 satisfied subscribers today. Can’t wait to try these. They look so good! These blueberry biscuits are a treat. I used self-rising flour and made “buttermilk” with vinegar and sweet milk. Thanks for the recipe. You’re very welcome. Have a wonderful week! These look very good.. I make Biscuits, or as they are called here in Australia, Scones, all the time.. I grew up calling them biscuits.. From NYS, originally.. I will give the blueberry version a try.. Do look good. A local Bakery makes Blueberry Scones with white chocolate in them.. They taste very good, so may venture to add that one day, too. Thank you for your Southern Recipes. I do so enjoy them.. So happy you are enjoying the recipes, Sue. Happy to have you on our site. Thank you for your comment and have a great weekend. Made these this morning they were awesome. Thank you so much Doris. Happy you enjoyed the biscuits and thank you for letting me know. Have a great weekend. Can I use either regular milk or sour milk? Yes, you could do that Ursula. 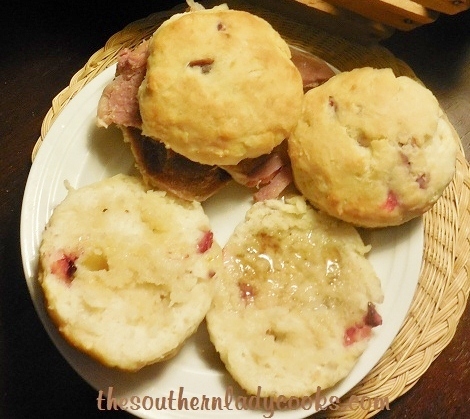 These sound so yummy..I make buttermilk biscuits already now these….can I do them as drop biscuits? Yes, I think you could Terry. I just made these for the first time this morning. I used frozen as I had no fresh blueberries and regular whole milk. I also put extra blueberries as I love them and am a diabetic (blueberries good for diabetics). A slight dab of butter and a little honey on top. They’re delicious! I just made these using regular milk and frozen blueberries, because that’s what I had on hand, and they were delicious. The butter and honey really topped them off. Thanks. Love your recipes. Thank you Marlene! Happy you enjoy the recipes and the biscuits were good. Good with dried cherries or cranberries reconstituted a bit with apple juice? Can i replace buttermilk with whole milk? Yes, you could do that, Donna. These sound so yummy, this will be a recipe I def. try.. Thanks for sharing..
What’s diff tween these & scones? Scones are biscuits, too. That is what the British call biscuits. Made these Judy did you forget the salt in these? I made them as written but 1/4 teaspoon of salt I will add next time good. Hi Carol, I seldom add salt to my recipes. I am not big on salt. My mother and sister both had high blood pressure bad and ate salt all the time. I never eat it and never had a problem. I usually say “salt to taste” or salt “optional”. Baking powder has sodium in it. Those biscuits look absolutely awesome! I will be making these. Yummy! I need to try these. I have the same blue checked cloth – got it years ago from my grandmother from NC. Buttermilk biscuits with blueberries sounds terrific. These look so tasty! Nice pictures too!